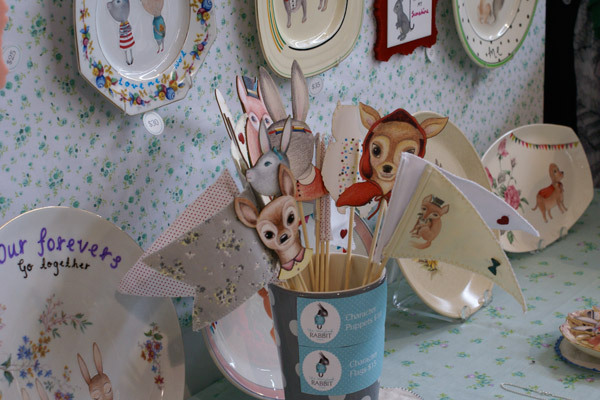 FK chats to Made by White’s Kelly White and her new project, The Storybook Rabbit. Tell us about The Storybook Rabbit and what we can expect to find. The Storybook Rabbit is a little creation of mine which I started this year that combines some of my favourite things like illustration, design, op shopping, collecting things, my pet bunny Juno and life-long love of animals to create products like vintage Illustrated plates featuring my characters, jewellery, mini prints and other small creations on vintage bric-a-brac I may have stumbled across in my travels. 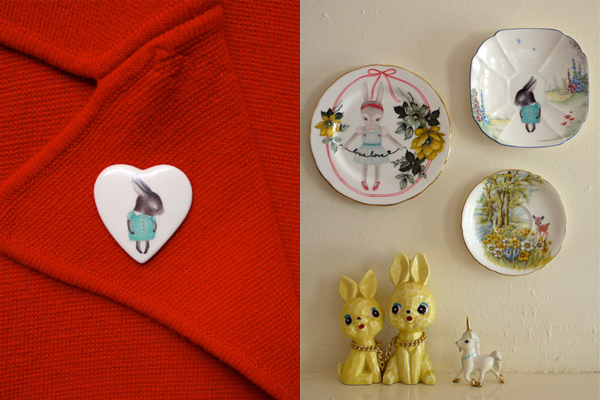 It’s basically a little etsy shop filled with lots of love and rabbity goodness. What lead you to start working on your own label and what inspired you? I’ve been one half of Made By White with my very talented sister Lyndsay for a few years now which has always been a great way to draw silly little things and turn them into fun wearable jewellery. But I really love to draw detailed, pretty things, which we have found don’t translate that well into laser cut jewellery a lot of the time, so The Storybook Rabbit is my outlet for that. 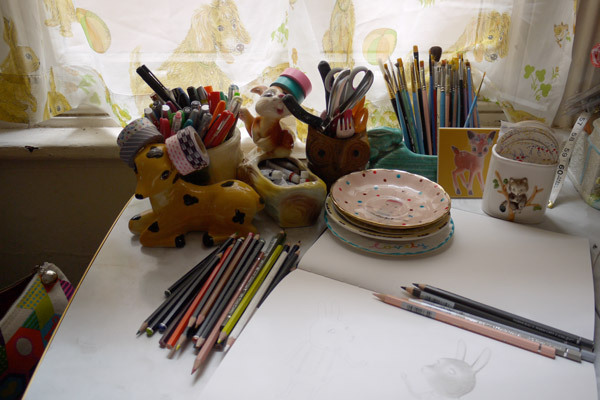 I can print my drawings in their original hand-coloured form and decorate things I love, like vintage floral plates and old china collectables. I am generally inspired by nature, animals, love, happiness and even the plate I’m working with at the time, sometimes a certain plate screams for a skipping bunny or well dressed duck to be stuck right there in the middle of it. I love everything old and pretty, because things these days really arent made like they used to be! I can thank my mum for my vintage obsession, she’s been a collector for as long as I can remember and she always finds me little trinkets and plates from markets and op-shops to add to my own collections. 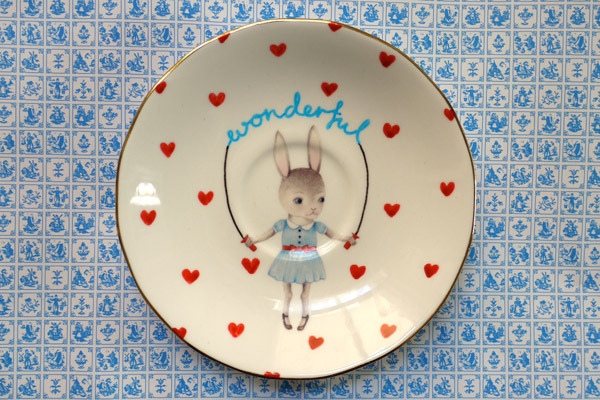 Where do you find your beautiful vintage plates and inspiration for your illustrations? 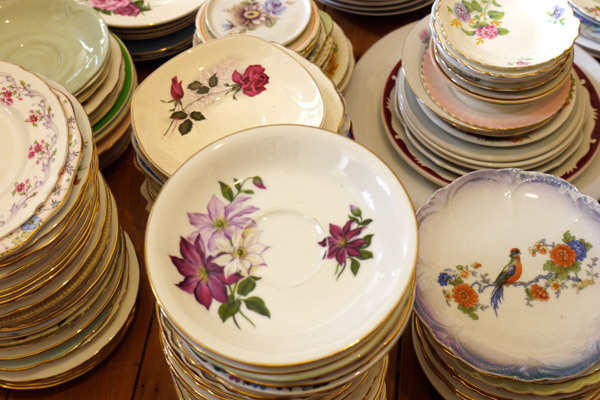 Finding plates is an ongoing adventure, I scour vintage markets and op shops as often as I can. I’ve just come home from a huge road trip through country Victoria to find new (old) plates! It was the best fun I’ve had, ever. I love walking into an op shop and shuffling through stacks of plates and shelves of nic nacs, because sometimes you never know what amazing beautiful thing someone might have throw away! I also now have a lot of people that know what I do and are lovely enough to snap things up here and there for me, which is always a nice surprise! My Illustrations start as a little idea in my mind and develop into new friends. I spend a lot of time with my fat black bunny who has more character than I could ever capture on paper! Also my house is filled to the brim with collections of ceramic animals, 1950’s ballerinas, art prints and of course vintage china, all of which I love to admire and use as inspiration. What do you love about working on The Storybook Rabbit? I like working on my own project because everything I do is just a tiny thought from my (more often than not) bunny-filled brain, but so many people can relate to it and like what I do, which is really cool. 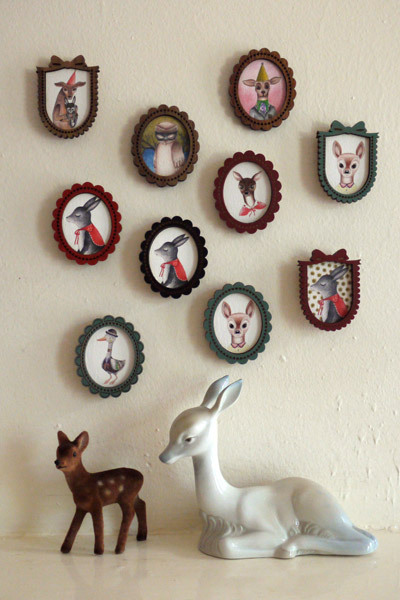 I love the special people you meet along the way who appreciate the work that goes into each piece and I love that all the little things I’ve made are living in lots of new homes around the world, with other rabbit or deer obsessed people who like pretty old plates as much as me. What are three of your favourite artists that inspire you and why? Without a doubt my favourite artist is Beci Orpin, her work just sums up everything I love and everything she does is completely pretty and original. I mostly like a lot of local talent, Kareena Zerefos and Sarah McNeil are also favourites of mine, but basically anyone who is a little animal obsessed and draws in beautiful realistic detail has my heart! What current products are you working on and where do you hope to take The Storybook Rabbit in the future? At the moment (and just about always) I am making LOTS of plates! I have collected some really amazing & really old british china on my trip though Victoria and I’m slowly working through it all, matching each plate with a new woodland friend and hand drawing in small thoughts and sweet nothings if needed. I’m also getting ready for the Sydney Finders Keepers in December, which I just cant wait to be part of again. At the moment I’m enjoying The Storybook Rabbit being what it is, a part time side-project I really love doing. It would be nice to make it my full time job, but sometimes I think that can take all the fun out of things, which would be a shame. Hopefully sometime soon I can start selling my products to shops I love, but until I find more hours in the day, I’ll just keep making pretty things on the lounge room floor with a certain little black bunny supervising my every move.